It is an itinerary that starts on the plain and ends in the Blenio valley, where we'll find the most unique vineyards in Cantone. The right side of Ticino enjoys excellent sun exposure, which makes the territory ideal for cultivating grapes. You can taste it in the wines of Gudo, which we can sample at the Cantina Pian Marnino, the Cantina Ramelli or the La Segrisola company. 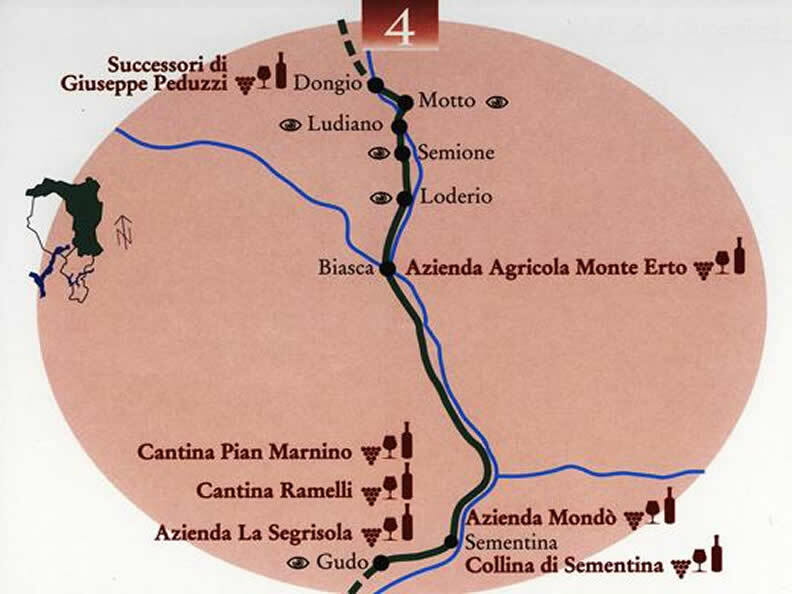 After a visit to the ancient church of St. Maria a Progero (frescoes), we'll continue towards Sementina and the Mondò and Collina di Sementin companies, facing the Magadino plain. Here, as in Gudo, small businesses have integrated production and precise wine-making. We'll continue passing Carasso and the right shore of the Riviera until reaching Biasca, where we can find the young commercial farm Monte Erto, with vineyards also in lower Lenio. Taking the valley of the Sun: we are in the region that was once devastated by flooding. In Loderio we'll discover the oratory of the Natività di Maria, buried by a landslide in 1868 and freed only a few years ago. Nearby, in Semione, we'll visit the ruins of the Serravalle castle and the "chapel of the dead" in the churchyard (remarkable frescoes). The vineyards of Ludiano are very interesting: they are everywhere, even amongst the "ganne", or heaps of stone. In the past, people learned how to use the heat absorbed by these masses and transmit it to the vines: this explains the "töppie" (arbours) overlapping the stones. It is well worth admiring these masterpieces of rural architecture. The "grotti" area is also very enjoyable to see, with big trees shading the tables and frescoes and the houses. On the road to Dongio, in Motto, we'll find the St. Peter oratory, which dates from Romanesque times. Our itinerary comes to an end in Donigo (where the wine company Peduzzi is located), with a walk in the mountains behind the inhabited area, where there are still some "grotti".